India has successfully launched its first mission to the Moon. The unmanned Chandrayaan 1 spacecraft blasted off smoothly from a launch pad in southern Andhra Pradesh to embark on a two-year mission of exploration. The physical exploration of the Moon began when Luna 2, a space probe launched by the Soviet Union, impacted the surface of the Moon on September 14, 1959. In 1969, Project Apollo first successfully landed people (Neil Armstrong commander of the Apollo 11) on the Moon. They placed scientific experiments there and returned rocks and data that suggested the Moon is of a similar composition to the Earth. Today, Indian Space Research Organization (ISRO) launched Chandrayaan-1, an unmanned lunar orbiter. The lunar probe will revolve around the Moon for 2 years taking high resolution images of the lunar surface and also mapping its chemical and mineralogical content. One of the primary objectives of the mission is to map the lunar surface for helium-3. It is believed that the Moon has vast quantities of the mineral which could be used to fuel future nuclear fusion reactors. Chandrayaan means moon vehicle in sanskrit. However, it was earlier named Somayaana. 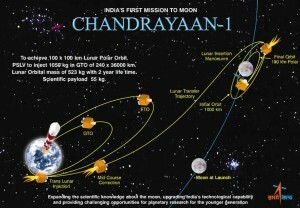 Chandrayaan-I is India’s first unmanned mission to moon. It was first proposed by ISRO in 1999. Government of India nod in 2003. The 3,86,000 KM journey is expected to completed in 5 1/2 days. 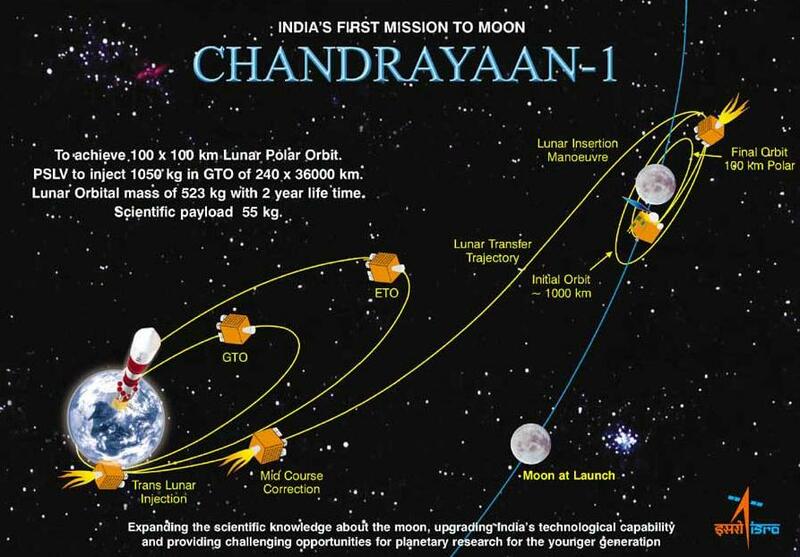 Chandrayaan-I will spend two years circling moon and it will remain 100KM away from the moon surface. It is launched using Polar Satellite Launch Vehicle ( PSLV). PSLV-C11 launched a 1304 kg remote sensing satellite (five satellite from ISRO and six from other space agencies [three from European Space Agency, one from Bulgaria and two from NASA]) as part of the Chandrayaan lunar exploration mission. The launch was successful and the satellite was placed in the earth’s orbit and will reach the Moon in 5.5 days after reaching its lunar transfer orbit. Over a 1000 space scientists and engineers working on the project. Chandrayaan-1 was built at ISRO’s Satellite Centre, Bangalore, with contribution from various wings of the space agency, including the Vikram Sarabhai Space Centre in Thiruvananthapuram. High resolution mineralogical and chemical imaging of permanently shadowed north and south polar regions. Observation of X-ray spectrum greater than 10 keV and stereographic coverage of most of the moon’s surface with 5 m resolution, to provide new insights in understanding the moon’s origin and evolution.